A student shows off his research at the Carroll College Student Undergraduate Research Festival. The Council on Undergraduate Research (CUR) held its first meeting in 1979, an outgrowth of the first Directory on Undergraduate Research in Chemistry at Undergraduate Institutions. Over the years, other branches of the sciences were added to the roster and in 1987 the first National Conference on Undergraduate Research was held at Colgate University. The year 2008 saw the addition of the Arts and Humanities division, and with that came an expanded moniker for undergraduate research: undergraduate research, scholarship, and creativity, as well as greater awareness that this work takes place in all disciplines. Undergraduate research has now been embraced by the campus community, and its trajectory Carroll College reflects the evolution of CUR. 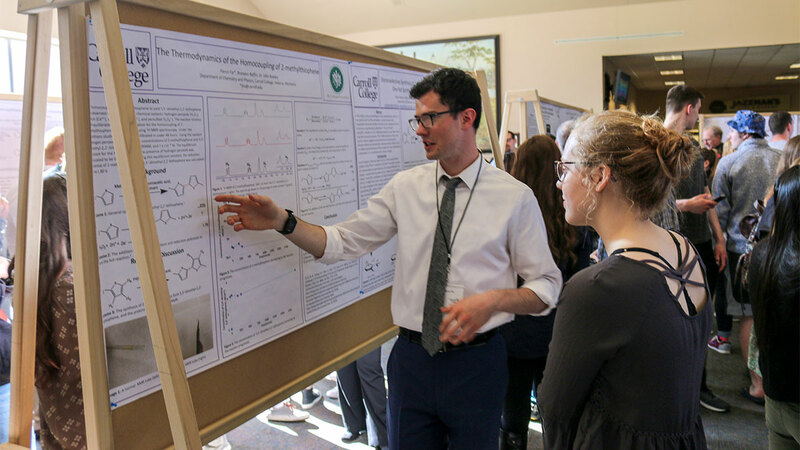 In the first year of the Student Undergraduate Research Festival (SURF), it was largely, although not exclusively, students in the sciences who shared the exciting work they were pursuing in conjunction with faculty mentors. This led the organizers to the conclusion that not only did we need to reach out more intentionally to the other disciplines, but also that we needed to think more broadly about what undergraduate research means. For the sciences, students may work on projects with their faculty members or on their own. In the humanities, undergraduate research is often a solitary pursuit amidst primary sources and the faculty member serves as a guide and a mentor. In theater, undergraduate research may combine a performance with research on some aspect of that production. The variety of research methods and modes of presentation also vary. For some, the accepted means of transmission is the reading of a paper, for others posters work well, and for still others a group presentation is the best reflection of their intellectual pursuits. With all of these in mind, undergraduate research is ascending at Carroll College. If you have questions about undergraduate research at Carroll College, please contact the Academic Affairs office.